The idea of raising chickens has always fascinated me. As my wife and I are big believers in organic foods and reducing carbon footprint wherever possible, I thought this would be a fun project for our family. I spent several months reading and designing what my coop would look like. It went all the way from a grand hen palace to a box with a hole in it. 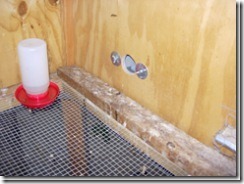 I’m half way through building it and it is now occupied by 2 little chicks. Building the coop was a lot of planning and trying to figure out what would work best. I had a basic idea of what I wanted the coop to look like and the functionality I wanted, but I still spent several months drawing out different plans, and even went so far as to build a small scale model out of cardboard to see how everything would eventually fit together and work. I’ll be posting a set of plans and a bill of materials in a couple of months. 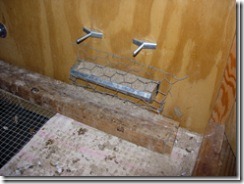 · Removable wire screen floor: It pops out for easy cleaning. There is plenty of air-flow from the bottom and I have a couple of towels in there that can go into the washing machine whenever they are too dirty. · Raised on Stilts: The chicken poop falls down to the dirt below. 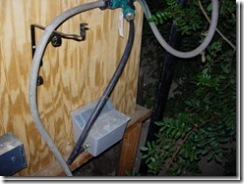 The reason for this is it makes it easier to shovel into a bucket and put in the compost bin. · Steeple Window: I wanted to make sure they were getting plenty of light, so I constructed the steeple windows and covered them with chicken wire. Since we live in southern California, I’m more concerned about the heat than about the winter months. 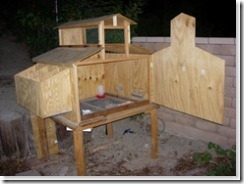 · Roof on hinges: The lower roof on both sides are hinged, making for easy access to the coop as well as for airing out. · Front panel swings open: The front panel also has hinges on the right side, with a little latch on the left to keep it secure, so I can literally swing the wall out and have easy access to the entire coop. 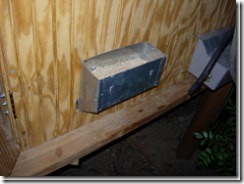 · Automatic Feed Bin: There is also a small food bin that I’m looking to enlarge – right now it holds about 4 or 5 days worth of feed, but I want to see if I can’t build it out to a month’s worth of feed holder. It was originally designed to hold rabbit pellets and the mouth is rather wide, allowing some of the chicks to jump into the bin and poop on the food. I fixed this by stretching a bit of chicken wire over the top and stapling it in place. Viola! problem solved. · Nesting boxes: Right now they are little chicks about 3 weeks old, but in a couple of months they’ll want their own little nesting boxes. 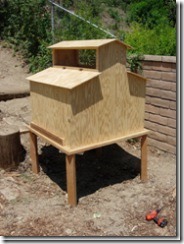 · Paint the coop: My wife wants it to match our house. · Put composite roof on: so it will somewhat match our red tile roof on the house. · Ramp, sliding door, chicken wire enclosure: Soon they’ll need more room than the 16 square feet inside the coop, so I’ll be building a little safe outdoors area for them on the slope behind the coop that they can walk out to during the day. Assuming that the coop is a success and all the basics are completed, I want to see about adding a couple of geek features to the coop. Some of these features include. · Solar Power: I’d like to mount a couple of solar panels and a converter to the coop so I can run a small light in the winter (this will help them to produce more eggs in the winter months) and run a small fan in the summer (where temperatures can reach over 100 degrees). · Webcam: I really like watching the chickens do their thing when I get home from work, it might be fun to hook up a wireless webcam and put a live feed on the web. · Weather Station: Since it’s already got kind of a steeple, putting up a small weather vane and a couple metrological gauges might be a fun project as well.